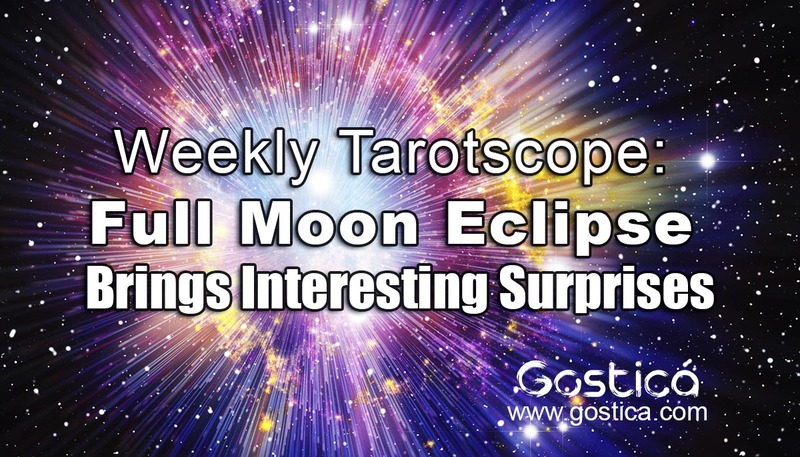 This week will be full of surprises, so if you aren’t careful you may be caught off guard. Luckily, this weekly tarotscope can give you some much-needed guidance. On Wednesday, the sun is in Leo and goes square with Uranus in Neptune. What this means is your finances are going to be affected. Maybe you finally have the money to buy that expensive thing you have been needing? Friday marks the midpoint of summer 2018 eclipse season. The full moon in communal, idealistic Aquarius arrives with extra fanfare as a total lunar eclipse, the second in a trio of eclipses taking place between June 12 and August 11. And with it comes a loud, clear message to come together. Mercury will go retrograde on Thursday, so remember to keep a check on your communication skills. 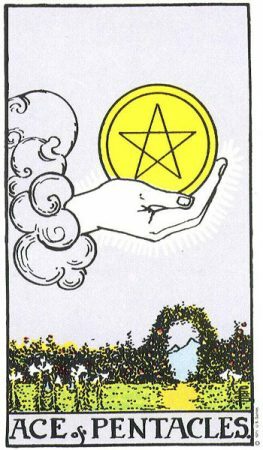 The Ace of Pentacles is likely to find you enjoying a new beginning on several levels, and this is a very positive new beginning. You could be offered a promotion and increase in salary or given recognition for your efforts of late. This is all fab but there may be something even better on the horizon for you, have you been dreaming of a new project recently? What insights have you had regarding your finances and career? This card showing up is a positive omen that things are looking up and are set to improve, you may be considering starting a new business, or perhaps starting a new job or founding a home or decorating it. Either way, this week you’re likely to be seeing your life differently with a fresh and excitingly new perspective, this is an optimal time to give your skills and abilities expression, manifest your capabilities let the world see your greatness and your life will be all the richer for it. 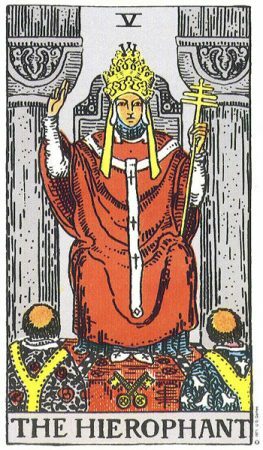 The Hierophant is very much about “doing the right thing.” You may be struggling with an issue and are unsure about what is “right” for you to do. Know that the answers are within you. Remember that the “right” thing is what is right for you also. This is also a card that is very much about spirituality – everything from traditional religion to earth-centered spirituality and any other spiritual notion that you can conceive of. There may be a tension between your idea of spirituality and the “right thing” and the ideas of others around you. Stand up for your own beliefs. 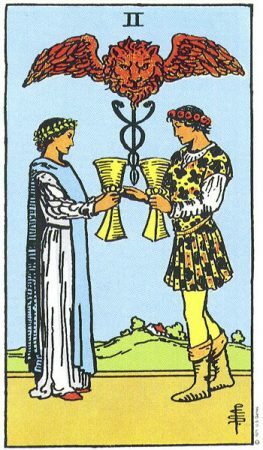 The Two of Cups often refers to a romantic partnership, but that is not its only connotation. It can speak of balance, friendship, joy, and sharing. In general, this is a card that says that things are likely to be going well. You should be feeling more than usually loved, cared for, and content. If you have been dreaming big about a project that has been delayed, this could be the time that it moves forward with positive momentum. If you’re in a relationship, it’s possible that it will deepen and become sweeter for you this week. If you’re single, this is a great time to get out, mingle, and have conversations with the people and try to have fun! Use the good energy of this time to enhance your life, what have you been wanting to do recently? Give it a go! 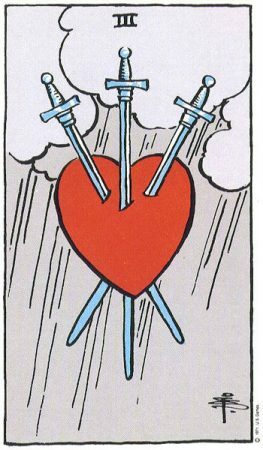 The Three of Swords is depicted in most Tarot decks as a heart with Swords going through it but it is not all bad. Although there is an element of sorrow that is undeniable when this card appears, what lies on the other side of this sorrow can be enhanced by understanding and joy. Allow yourself to fully experience any sorrow or pain that comes up now so that you can move beyond it. In general, this card can point to very deep emotional issues that must be addressed before you can move on. Denying pain does not make it go away (any more than denying a broken leg makes it heal.) However, attention must be paid to balance here also as it must be paid with the 2 of Swords. Allow yourself to experience any pain that comes up now, but do not wallow in it. You do not and should not wallow in grief or sorrow for long. However only you can decide how long is long enough. Others can’t decide it for you. The Page of Swords can sometimes stand in for a literal person in our lives. If so, in this case, the page will represent a person who is younger than you, who is likely to have light-colored hair. A message may be coming that may not be what you were hoping to hear. You may be trying too hard, pushing too fast, or in general stepping on the toes of others. And you may need to study the body language of others, and consider how well you do (or do not) accept constructive criticism from others. You are likely to have a great deal of mental and physical energy now. Use it wisely. You could feel a little uncomfortable at times and may feel that you’re being false, especially if you’re the type of person that prefers to be more straightforward and honest, but sometimes life requires us to show subterfuge to achieve the desired result. 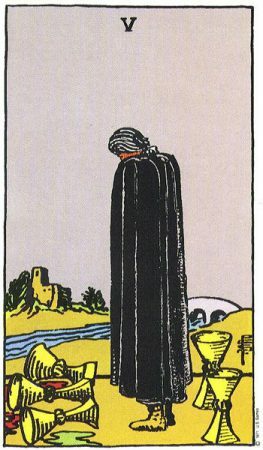 The Five of Cups reminds us that where we put our focus in life has a great deal to do with the quality of our lives and how well they work for us. What are you going to choose to focus on? 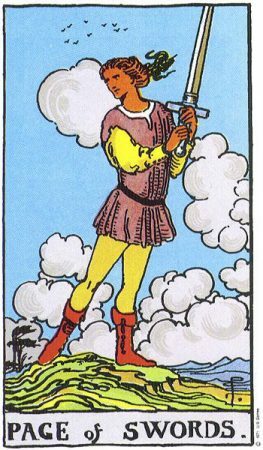 In most Tarot decks, most depictions on each card give solid guides toward interpretation, for this card, this is more than usually the case. Most often, a sad or downcast figure is shown, with five cups. Three are spilled, and two remain upright and whole. The implication is extremely clear; are you going to cry over “spilled milk” or are you going to focus on the “milk” you still have, and get on with things? The point is: watch where you put your focus and make sure that the focus is for your highest good. There’s a possibility that a particular task that’s seemed daunting to you until now will be exciting to you and you’ll be able to use your amazing power to take hold of the situation and get the job done with finesse, go you! 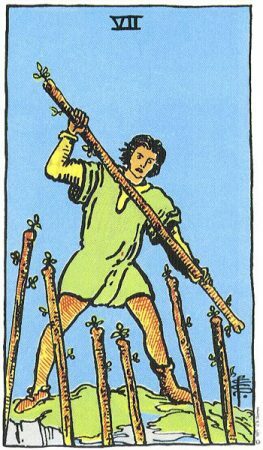 The Two of Wands means it will be important for you to keep your balance in every way that you can – even to the mundane, boring things like eating right and getting enough rest. These things will be very helpful to you during this time. You may enter into a partnership with one other person. This can be business or personal, or both. Although this is a very positive card, it shows also a need to keep your wits about you, that although you deserve and should treat yourself to some fun, but know that you are still in a building up phase and now is not the time to rest completely on your laurels. This card can also sometimes mean that you will be moving your place of residence. You may be quite the alchemist mixing and matching your words and approaches with different people to find what is truly right for you. Although all your relationships are likely to be going quite well for you, you may just want to look at your deeper personal issues and see if these could be standing in your way, and if they are, you’ll find ways to work through them and integrate them. Don’t hesitate to make where you stand clear to people. Your thinking is clear, and you are likely to help someone out by spelling things out for them. This card can show that a change is coming, a positive change in your personal or business life. This card also points toward being independent and thinking for yourself. Think of this week as an opportunity to see things differently and a chance to feel your emotions wholeheartedly. This is the perfect time to increase self-love, you can do this by giving yourself only the things and experiences that make you feel good, for instance, choose clothes to wear that you feel nice in, eat nutritious and tasty food that you enjoy, listen to the music you love, express your love. The Page of Wands reminds you that have a chance of getting to know yourself more deeply this week Sagittarius, you’re likely to be going through a period of weighing things up or deciding something, there’s an air of balance wisdom and fairness surrounding you this week and you’ll probably want to use your rational faculties to judge a situation fairly. An agreement may be reached through negotiation and looking for fair solutions, you’ll want balance and you will be striving for this with all of your dealings with others. By looking at things objectively you’ll have a chance of gaining a clearer understanding of yourself, others and the situations that arise this week. Trust your gut as your higher self is guiding you to be more honest and truthful with yourself, by accepting the situation in which you find yourself you’ll cultivate more honesty, responsibility, and humility. If you can resist blaming others and try to accept responsibility for any part that you have played, you will be able to move forward gracefully, hopefully, you’ll harness the energy of this week and move on and not get stuck in denial or resentment. 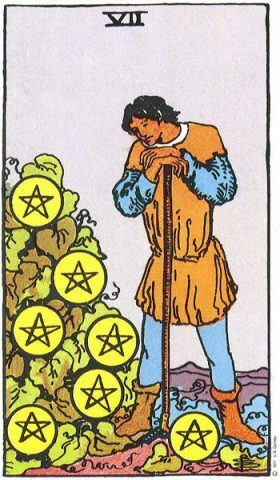 The Seven of Pentacles is very often a card about returns on investments. This can be literal such as a bank account returning money to you, or figuratively, such as the investments of time, effort, and energy that you have put into a relationship. In general, you should be feeling more secure than you have in a while. Things will be moving along well, and you’ll be feeling hopeful about the future – with good cause. You may have to decide whether to put your energy into the things, people, and situations that you already are involved with, or whether to spend your energy trying to bring more into your life. Choose wisely. Perhaps having faith and hope that the end will justify the means will help you, this isn’t a good time to act aggressively, instead, it’s a good time to ‘play your cards close to your chest and maybe also be economical with the truth if you want to defuse the situation. Clear and logical thinking could be beneficial to you, also deliberate charm could help negotiations run smoothly. 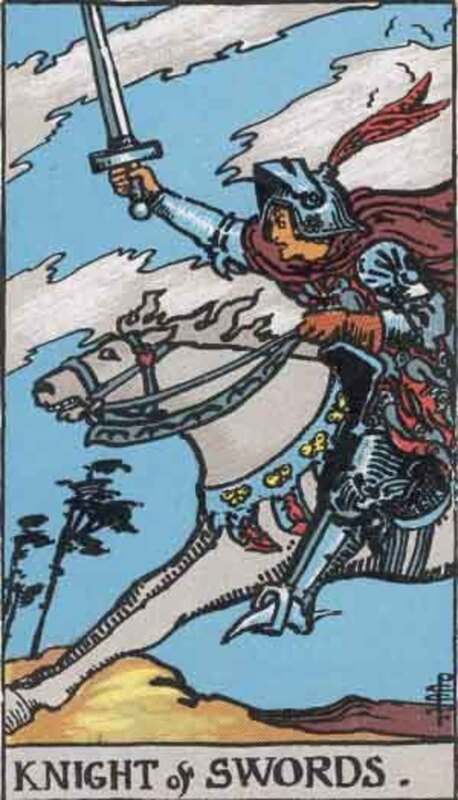 The Knight of Swords reminds you that it’s all change this week Aquarius, there’s likely going to be a transformation in your perspective and perhaps some upheaval. You’re entering a mind-expanding time, where everyday patterns can be disrupted and where your life can change dramatically. You’re probably ready to expand your mental faculties and you could even move home or suddenly leave your job. 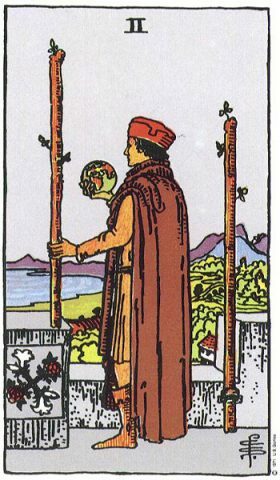 Whenever this card is drawn I know BIG change is on its way, it can either be a change in our lives with our job, home, relationship status or it can be an inner change, where we think and perceive things radically different, we can suddenly want to break away from what we’re doing and do something completely different. There could be an exciting event this week that feels like it’s sweeping you in a new direction, you may even decide to create this event yourself and channel your mental energies into something new and fresh. The Page of Pentacles says you could have improved finances, a promotion or an advancement this week Pisces. As it’s a page, it symbolizes a new beginning and it needs to be taken seriously to fully bring something to fruition. This card signifies a slow a steady but sure manifestation of deeply held idea or vision that you have. You are being given an opportunity to start a career that holds great potential, or maybe a hobby that you could turn into a lucrative income. Whichever one it is, I sense you have the chance to build up your energy and resources in order to create something tangible. You must nurture this process as it’s a new beginning it is much like the first flowers of spring as they are beginning to bud, they are delicate and could be easily crushed by negativity or self-doubt. You have a love of learning and are full to the brim with new ideas, you can expect future success of an innovative venture if you are willing to start at the bottom and work your way up, you are ready to take on a task that involves hard work because you know it will pay off in the end. You have excellent future prospects but may sometimes have to be patient if you are to make a success out of this opportunity, hard work will definitely bring results. thank you so much for this weeks readings! Ever becoming, changing, growing…And so loving the power in that flow. Alignment is the New High.